Giuliano Vangi was born in 1931 in the Tuscan village of Barberino del Mugello and studied at the Istituto Statale dell’Arte in Florence. In 1959 he moved to Brazil in order to distance himself from the Renaissance humanist tradition. After spending three years in Brazil, Vangi returned to Italy to devote himself to his sculptural experiment, studying different types of materials in order to materialize various states of the human mind in concrete form. 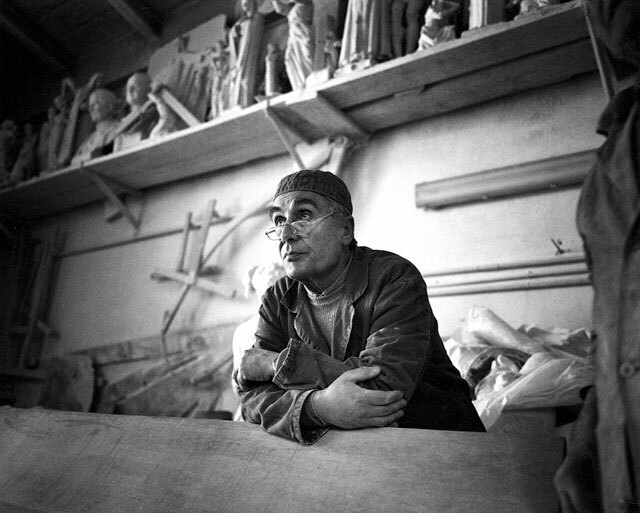 In 1967 Vangi presented a series of his sculptures in a personal exhibition at Florence’s Strozzi Palace, which won him a great deal of attention and praise, because his works seemed to refer to the sense of stagnation and contradiction felt by people in modern society. 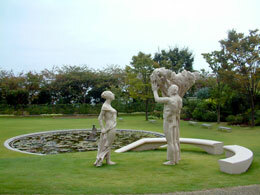 After this success he extended his activity, exhibiting his sculptures in Europe, Japan and the United States. Around the turn of the millennium, Vangi completed several religious pieces commissioned by the Catholic Church, at sites such as the Cathedral of Padua, the Duomo of Pisa, and the Church of Padre Pio in San Giovanni Rotondo. 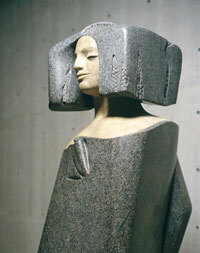 In 2002 Vangi won the Praemium Imperiale prize in the sculpture category, gained international fame. His work is now considered to be on the same level as that of great Italian postwar master sculptors such as Arturo Martini, Giacomo Manzù and Marino Marini. 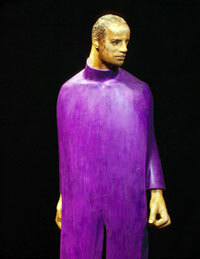 Vangi revived the traditional technique of inlay, using marble of various colors, and various metals to add a polychromatic effect to his sculptures of human figures. 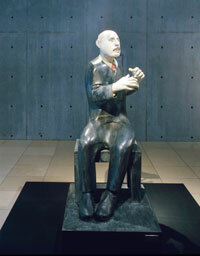 The works on display in the museum serve as reminders of Vangi’s remarkable life story and his devotion to sculpture. March 13, 1931 Born in Barberino del Mugello, Italy. 1950 (19 years old ) Began to study at Instituto Statale dell’Arte a Porta Romana, as the pupil of Bruno Innocenti. After completing his studies, taught at Instituto Statale dell’Arte in Pesaro. 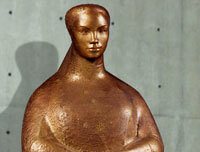 1959 ( 28 ) Moved to Brazil in order to broaden his artistic experience. After returning to Italy, lived in Varese, teaching at Istutito de ll’Arte, Cantù. 1967 ( 36 ) One-man exhibition at Palazzo Strozzi, Florence, organized by Carlo Rudovico Ragghianti. Followed by personal shows at Galleria Milione, Milan, and Badischer Kunstverein Karlsluhe, which gained international recognition for Vangi. 1972 ( 41 ) Participated in the collective exhibition "Italian Contemporary Sculptors" at The Hakone Open-Air Museum, marking the first time Vangi’s works were seen in Japan. 1988 ( 57 ) Solo exhibition at Gallery Universe, Tokyo. Vangi’s first solo exhibition in Japan. 1991 ( 60 ) Solo exhibition at the Castello Sant'Elmo in Naples. 1997 ( 66 ) Completed a pulpit and altar for the new chancel in the Cathedral of Padua. 2000 ( 69 ) Completed the sculptural group Passing the Threshold at the entrance hall of the Vatican Museum. Solo Exhibition "Studies for a Crucified" at the Salone delle Reali Poste in the Uffizi Gallery. 2004 ( 73 ) Completed pulpit and a series of sculptures for the Church of Padre Pio a San Giovanni Rotondo. 2005 ( 74 ) Solo exhibition at the Salone della Ragione of Padua. Completated Florenzia at the entrance hall in the Fuji Television Building in Daiba, Tokyo. Participated in the collective exhibition "Memories of the Classics in the Art of the 20th Century" at the Pitti Palace, Florence. Solo exhibition in Sassoferrato in Marche and Gallerie Nove in Berlin. 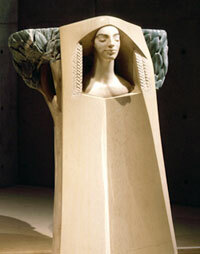 Current Vangi currently lives and works in Pesaro and Pietrasanta.